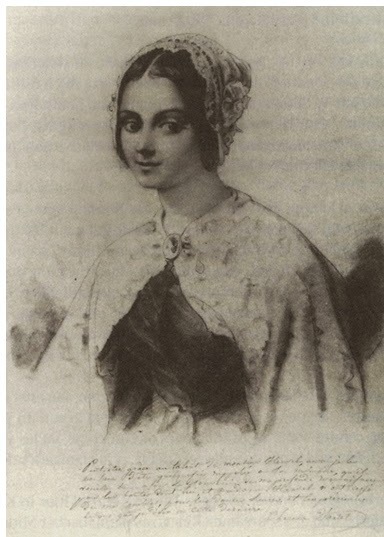 It is unknown but to a few genealogy aficionados that the House of Philippy de Bucelly d'Estrées was intimately connected to the musical world of France through Gabrielle Constance (April 14, 1782 -November 20, 1854) and the marriages of her descendants. Gabrielle Constance was the only daughter of Albert I Philippi de Bucelly du Tronquoy,baron d' Estrées (1745-1808) and Catherine GEORGIA (1753-1810). Gabrielle married in 1813 Martin-Joseph ANDRIEN (alternative spelling of ADRIEN). He was born on May 26, 1767 and died in 1822. The ANDRIEN family was known for their musical talent. Originally from Liege, they moved to Paris. It was in Paris where the ANDRIEN brothers (Martin, Arnold-Michel, and Ferdinand) found their artistic positions and fame. For example, Ferdinand become the Chief Choir Master at the Paris Opera from from 1789 to 1801. "Beautiful voice, handsome physique, good musician... of good character and honest. With all those qualities, he should go far [in his career]" ( Frantzen:1967, 45). 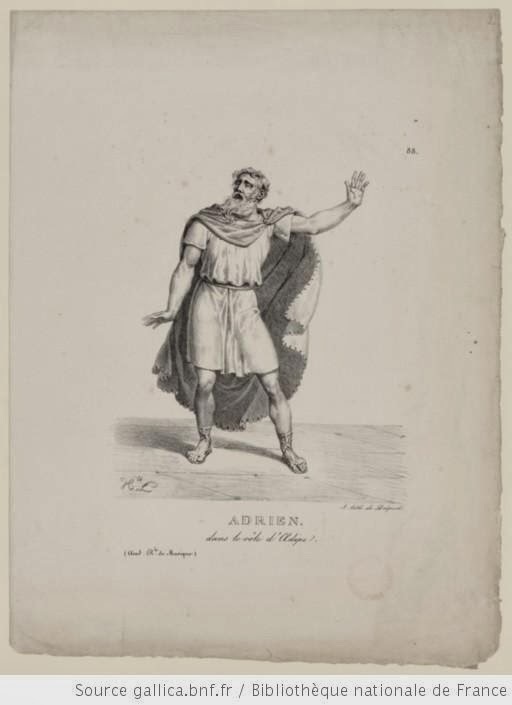 On Jun 20, 1785 he entered the Opera in Paris and sung roles for the Bass voice. He retired from the Paris Opera in 1804 and began a career as a voice and declamation instructor. He become Chef du Chant a la Académie Royal de Music (the precursor of the Paris Opera House) and Professor of Declamation at the L’École Royal. He was also a composer. Some of his compositions were: Hymne a la Victoire on the evacuation of the French territory in 1795, and an Invocation a l'Etre supreme in 1793. He was a friend of the French painter Pierre-Narcisse Guérin (1774-1833) and served as a model for one of this painting entitled "Phaedra and Hippolytus" (1802), which is now conserved at the Louvre Museum in Paris, France. 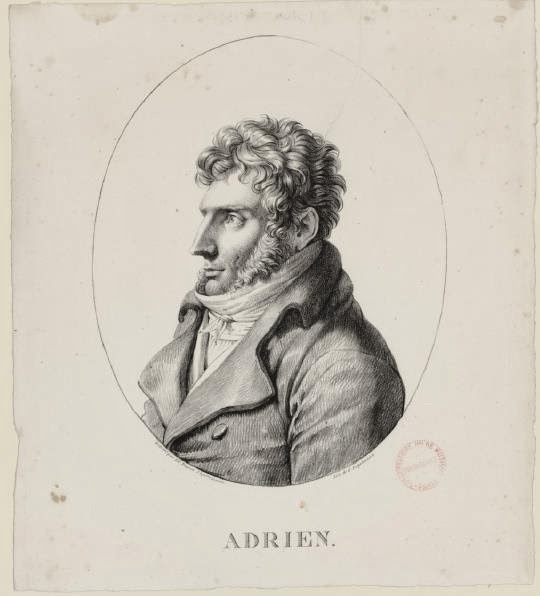 It was the painter Guérin who also drew the image of "Adrien" which the lithograph is based on. Martin Joseph fathered two daughters with Constance Gabrielle. The first one was born on July 2, 1814. She was named Atala Thérèse, possibly after the novel "Atala" written in 1801 by François-René de Chateaubriand. Atala was known artistically by her second name. His second daughter was born on July 14, 1817 and was named Rosine-Charlotte perhaps after the Italian Opera composer Gioachimo Rosini (1792–1868). By the time of the birth of Rosine, Gioachimo Rosini's operas were already a sensation in Europe. Ironically, both sisters later married musicians from the Royal Conservatory. Lithograph of Martin Joseph ADRIEN/ANDRIEN in the operatic role of Oedipe. Lithograph by Hippolyte L[ecomte]1840. "Composed studies for the piano; played piano, the first woman instrumentalist to play at the Conservatory of Music in Paris, where she was also a pupil" (722). Lessons on the Pianoforte Sonatas of Beethoven. Atala married on June 4, 1833 Pierre-François WARTEL (1806-1882). It appears that the life of Wartel is very well documented due to his important role in the artistic life of Paris in the 19th century. In 1825, Wartel enrolled at the Paris Conservatory of Music and was a pupil of Fromental HALEVY (1799-1862) who was a well known music educator and composer. Among the pupils of Halevy was Georges Bizet (1838-1875). Wartel went on to study at the Institute de la Musique Religieuse and in 1829 obtained first prize for his signing. From 1831 to 1846, Wartel joined the Paris Opera as a Tenor. Just like his Father-in-Law, he become a music teacher after he left the Paris Opera. Some of his pupils included Christine NILSSON and Zelia TREBELLI-BETTINI. Louis Emile Wartel (1834) and issued. Jules Wartel (1835-1868) and issued. It appears that Louis Emile Wartel followed his father's footsteps and also become a singer at the Théâtre Lyrique from 1858-1868. He was known for his roles as a baritone. Some of the title roles that he played were "Bartholo" in Les noces de Figaro and "Sparafucile" in Rigoletto. Rosine, like her older sister, also entered the Paris Conservatory of Music. The documents from the Paris Conservatory of Music confirm that she was awarded First Prize in 1829 for Piano and again in 1831 she received First Prize for Harmony and Accompaniment. She also taught solfege at the conservatory. There are over one-hundred musical pieces arranged by Rosine-Charlotte-Andrien as well. Perhaps it was her outstanding musicianship that attracted the renowned declamation teacher François Alexandre Nicolas Chéri Delsarte ( 1811-1871) to her. Some of the Children of Rosine and François died tragically. For example, Xavier died of Cholera in 1864. The brilliant career of Gustave was cut short by disease. 2) "Biographie nationale de Belgique" by F.-J. Fétis regarding Martin-Joseph ANDRIEN and ANDRIEN brothers. 3) Many thanks to S. PORTZERT for her valuable information and insight. 4) The National Library of France (BNF) online archives.